December 30, 2012: Salt and pepper (Lomatium piperi) was observed in bloom on burned grasslands near Horsethief Butte in the Columbia Hills State Park, this despite several inches of crusty snow on the ground. A few of last fall's hairy goldasters (Heterotheca villosa) were also observed still in bloom. An animal highlight was a red fox which was seen along with its tracks. December 22, 2012: The first salt and pepper (Lomatium piperi) was observed in bloom along the bike trail near Maui Falls between Coyote Wall and the Labyrinth. A Hood's phlox (Phlox hoodii) was observed in bud atop rock outcrops near the upper end of the Labyrinth. May 27, 2012: Twin Tunnels Trail (old Highway 30 east of Hood River, OR between the West and East Mark O. Hatfield Trailheads. April 12, 2012: Private property on the east side of Swale Canyon. April 12, 2012: Interstate 84 between Troutdale and Hood River. It's amazing how much change can take place in a matter of 3 days! The drive along the Columbia River (either via Interstate 84 or Washington Highway 14) has overnight become a very beautiful drive, especially early in the morning or in late afternoon as the black cottonwoods (Populus trichocarpa) have begun to leaf out with their golden yellow-green foliage contrasing with the yellow of the now flowering big-leaf maples (Acer macrophyllum) and new leafy foliage of many shrubs beneath the trees. Also one can find the shiny reddish-purple new foliage of poison oak (Rhus diversiloba - yes it's attractive despite the other negative effects) and numerous red-flowering currants (Ribes sanguineum) now in bloom. Any of the roads east of Hood River or White Salmon are likewise quite beautiful now too as the serviceberry (Amelanchier alnifolia), Columbia Gorge Lupine (Lupinus latifolius x sericeus) and balsamroots (Balsamorhiza careyana x deltoidea) are now beginning to bloom! April 9, 2012: The area between Memaloose and Rowena: Forest Service and Memaloose State Park lands. April 3, 2012, and April 7, 2012: Slopes between Catherine Creek and Minor Creek to above the powerlines. The April 7th hike was with the Native Plant Society of Oregon. April 7, 2012: The young leaves of black cottonwood (Populus trichocarpa) are now visible at a number of locations along Interstate 84 between Troutdale and Hood River. They are especially beautiful adjacent to Rooster Rock State Park. Pink mats of Douglasia (Douglasia laevigata) is now blooming on rocky cliffs west of Hood River. March 31, 2012: Bigleaf maples (Acer macrophyllum) are blooming from just west of Hood River east. They are probably more common on the Washington side, especially east of Major Creek. In the west Gorge, the scales covering the terminal leaf buds of black cottonwood (Populus trichocarpa) have popped and the leaves have begun to emerge. We did see an osprey today near Multnomah Falls. March 31, 2012: The upper east slopes above Swale Canyon at Wahkiacus (off Horseshoe Bend Road). Private property that several of us arranged to visit. March 27, 2012: Columbia Hills Natural Area Preserve - Turkey vultures were observed throughout the Gorge for the first time today. March 22, 2012: Twin Tunnels Trail from the Hood River Trailhead. Violet-green swallows were observed today for the first time. March 14 & 17, 2012: Cherry Orchard Trail - A Native Plant Society of Oregon hike. March 3, 2012: Catherine Creek - This was a Native Plant Society of Oregon field trip. February 26, 2012: Klickitat Trail (Pitt Trailhead south towards Dillacort Canyon mouth). The following species were observed beginning to bloom: scale pod (Idahoa scapigera), grass widows (Olsynium douglasii), Western saxifrage (the old Saxifraga occidentalis), Columbia desert parsley (Lomatium columbianum), pungent desert parsleys (Lomatium grayi), salt and pepper (Lomatium piperi), Gold Stars (Crocidium multicaule), the male catkins and female flowers of California filbert (Corylus cornuta var. californica), and the male catkins and female cones of white alder (Alnus rhombifolia). February 20, 2012: Catherine Creek. The grass widows (Olsynium douglasii) are becoming more numerous, but a full bloom is still several weeks away. 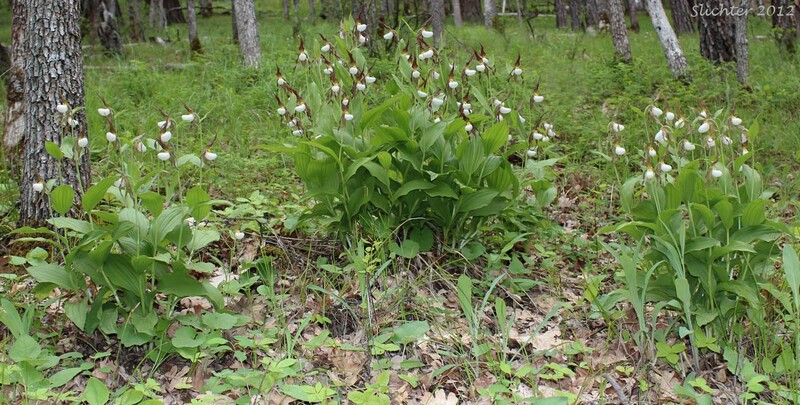 The leaves of numerous species are coming up from the cold ground and are now recognizable. Western saxifrage (the old Saxifraga occidentalis) are now beginning to bloom along the road west of the main parking area. The desert parsleys listed below are probably blooming too but we did not have time to look for them. February 20, 2012: Near the Cherry Orchard Trailhead on Highway 14. Numerous Columbia desert parsley (Lomatium columbianum) were observed in bloom just above the north side of the highway within 100 meters east of the parking area. The leaves are starting to become visible. Further east above the road, the first yellow bells (Fritillaria pudica) of the season as well as a few pungent desert parsleys (Lomatium grayi) were observed in bloom. February 20, 2012: Eightmile Canyon, Columbia Hills State Park. A few grass widows (Olsynium douglasii) are blooming here and there while the salt and peppers (probably Lomatium piperi) are more numerous. Several upland larkspurs (Delphinium nuttallianum) were observed with flower buds. The male catkins of the first California filberts (Corylus cornuta var. californica) were nearing bloom too. February 19, 2012: Old Highway 30 west of Wahkeena Falls. The first mountain kittentails (Synthyris missurica ssp. stellata) were observed just beginning to bloom. Give them a week or two and they should be much easier to find along the road. The leaves of poison larkspur (Delphinium trollifolium) were numerous in places along both Interstate 84 and Highway 30, with some up to 7 inches high. February 19, 2012: Eagle Creek Trail (Trailhead to a mile above Punchbowl Falls). The first western saxifrage (the old Saxifraga occidentalis) were blooming along west and southwest facing cliffs along the trail about one mile in from the trailhead. In addition, the first California filberts (Corylus cornuta var. californica) were begining to bloom a bit downhill from the same location. Several gold stars (Crocidium multicaule) were observed in bud. There were quite a few larkspur leaves visible along the trail, but it's too early to identify them yet. The leaves of sweet coltsfoot (Petasites frigidus) were also seen along the trail. The snow level (with nicely flocked conifers) was about 500' above the trail from near Punchbowl Falls and on upstream. February 15, 2012: The Labyrinth. A white alder (Alnus rhombifolia) is in full bloom along old Highway 8 between the Rowland Lake parking area and the water fall. Both female and male catkins were present. A few grass widows (Olsynium douglasii) are blooming here and there through the Labyrinth and on the open slopes east of Coyote Wall between old Highway 8 and roughly the 700' level. Salt and peppers (probably Lomatium piperi) are numerous at low elevations just above the old highway. Not much else was viewed getting ready to bloom. There is still a fair amount of old snow under the trees at about 1000'. Fresh snow was observed down to about 1000-1500' on both sides of the Gorge west of Hood River and the White Salmon River. Bloom will probably be delayed there again this year. I'd guess that most areas of the Gorge are a week or two later than last year. The exception might be the Columbia Hills which haven't gotten a lot of snow and have largely been above the clouds of the inversion layer that have lain above the river from the Dalles east. Since they have mostly been snow and cloud free, I'm at least seeing signs that plants are progressing towards spring more quickly there. February 11, 2012: Catherine Creek. A dozen or more grass widows (Olsynium douglasii) were observed in bloom north and west of the main parking area. A peregrine falcon was also observed flying overhead, shortly followed by an immature bald eagle escorted by 3 ravens. Numerous salt and peppers (probably Lomatium piperi) were also observed. A number of western saxifrage (the old Saxifraga occidentalis group) were observed with budding inflorescences nestled amongst their serrate basal leaves. A few leaves of upland larkspur (Delphinium nuttallianum) were observed for the first time today. February 11, 2012: Cherry Orchard Trailhead off SR14. Several Columbia desert parsley (Lomatium columbianum) were observed in bloom just above the north side of the highway within 100 meters east of the parking area. February 11, 2012: Doug's Beach. A dozen or more grass widows (Olsynium douglasii) were observed in bloom on the bench just north of the highway. Numerous leaves of panicled death camas (Zigadenus paniculatus) were also observed emerging from the ground. February 11, 2012: Deschutes River one quarter mile south of the Columbia River. White alder (Alnus rhombifolia) is in full bloom along the river. Both female and male catkins were observed in bloom. February 11, 2012: Old Highway 30 one mile east of Celilo, OR. Numerous grass widows (Olsynium douglasii) were observed in bloom. The basal leaves of gold stars (Crocidium multicaule) were observed, but no flower buds yet. The leaves of numerous young slender-fruited desert parsley were observed nearby, but no sign of their flowers yet. February 11, 2012: Old Highway 30 between the Chenoweth exit and the Discovery Center. Three Columbia desert parsley (Lomatium columbianum) and one pungent desert parsley (Lomatium grayi) were observed in bloom on talus slopes or against large boulders. Numerous basal leaves of scale pod (Idahoa scapigera) were also observed. February 4, 2012: Catherine Creek. A dozen or more grass widows (Olsynium douglasii) were observed in bloom with many more with flower buds apparent that were seen on slopes alongside Washington Highway SR14. February 4, 2012: Horsethief Butte. Many salt and peppers (probably Lomatium piperi) were in bloom. Many grass widows (Olsynium douglasii) with leaves from 1-4" high were observed, but none ready to bloom in the next few days. Numerous lacelip ferns (Cheilanthes gracillima) were observed in crack on the basalt cliffs of Horesthief Butte. A territorial redtail hawk was observed attacking an adult bald eagle and both turned and cartwheeled in the air with outstretched talons grasping at each other. A winter plummage oldsquaw (also known as sharptail duck) was observed on Horsethief Butte Lake which is unusual as it is a sea duck in the winter. February 2, 2012: Columbia Hills State Park. More than a dozen Dalles Mt. buttercups (Ranunculus triternatus) were observed in bloom along with several salt and peppers (probably Lomatium piperi). January 28, 2012: East Bank of the Deschutes River. The white alder (Alnus rhombifolia) are beginning to bloom along the lower Deschutes River. It is the pendant male catkins that are beginning to open so that the pollen-filled interiors are observable. Several salt and peppers (probably Lomatium piperi) were observed in bloom along the trail that winds along the east bank near milepost 3. Several pungent desert parsleys (Lomatium grayi) were also observed with leaves extending from the ground at this latter location. Generally, most desert parsleys begin to bloom within days of having visible leaves, so flowers will probably be evident within the next week or so. Four or five otters were observed frolicing in the river at about milepost 1. January 16-22, 2012: The first long-lived cold spell in the Gorge with up to one foot of snow on the ground and ice storms to boot! This should put an end to most of the late blooming wildflowers from 2011 but should only slow the early spring blooming plants which have been protected under a layer of insulating snow. This should also provide moisture well into March for a good wildflower bloom at that time! Another advantage of a prolonged snowfall is that it mats all the dried remains of weedy grasses down onto the ground where they can be decomposed (or consumed by herbivores more easily) eventually providing more sunlight for the native annuals and perennials the bloom early in the Gorge. January 9, 2012: The first grass widow (Olsynium douglasii) was observed in bloom on the east-facing slope between the paved trail and Catherine Creek. January 8, 2012: The first Dalles Mt. 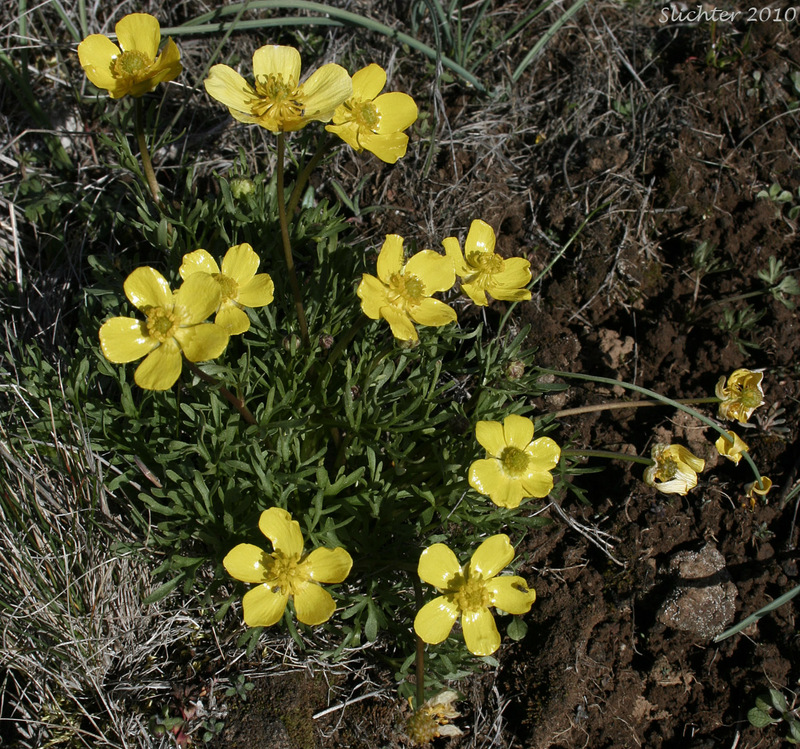 buttercups (Ranunculus triternatus) were observed in bud in the Columbia Hills State Park. Several were observed in full bloom by January 14. They weren't in bloom here until the first week of February in 2011. Several Canby's desert parsleys (Lomatium canbyi) were also observed in bloom on west-facing road cuts on the switchbacks along the access road to the microwave stations atop the Columbia Hills. The leaves of numerous salt and peppers (Lomatium gormanii or Lomatium piperi) were observed along the road where the powerline crosses the crest of the Columbia Hills, but they were not in bloom yet. January 1, 2012: The first salt and pepper (Lomatium piperi) was observed in bloom on gravelly soils above the north shore of the Columbia River near the Dalles River bridge. Hoary aster (Dieteria canescens) was also observed blooming at this location. The plants were from last years blooming stock. February 18, 2013: Memaloose Trail (Memaloose Overlook to Lone Pine Hills). Gold stars (Crocidium multicaule), Columbia desert parsley (Lomatium columbianum), pungent desert parsley (Lomatium grayi), salt and pepper (Lomatium piperi), grass widows (Olsynium douglasii) and the first western buttercup (Ranunculus occidentalis) were observed near Memaloose today. The Columbia desert parsleys are much bigger and more numerous today, although they are still just coming out of the ground. The grass widows are much more numerous, perhaps 100 per acre rather than the couple per acre in weeks past. They will be peaking in about 2-3 weeks unless there is a big change in the weather. February 9, 2013: The Cherry Orchard Trail. Woollypod milkvetch (Astragalus purhsii), Little western bittercress (Cardamine oligosperma), spring whitlow-grass (Draba verna), gold stars (Crocidium multicaule), smooth prairie stars (Lithophragma glabrum), smallflowered prairie stars (Lithophragma parviflorum), Columbia desert parsley (Lomatium columbianum), salt and pepper (Lomatium piperi) and grass widows (Olsynium douglasii). Most flowers are pretty sparse yet in terms of bloom, but look on south-facing slopes among rocks to find them. February 4, 2013: The first Dalles Mt. buttercups (Ranunculus triternatus) were observed blooming in Columbia Hills State Park. February 4, 2013: The first gold stars (Crocidium multicaule) were observed in bloom near the north end of the US Highway 197 bridge at The Dalles. February 3, 2013: The first ticks of the year were observed in search of human blood today! February 2, 2013: Labyrinth and Maui Falls Biker Trail. Several salt and peppers (probably Lomatium piperi), smooth prairie stars (Lithophragma glabrum) and grass widows (Olsynium douglasii) were observed in bloom along the trail. January 19, 2013: East Bank of the Deschutes River. The white alder (Alnus rhombifolia) are beginning to bloom along the lower Deschutes River. It is the pendant male catkins that are beginning to open so that the pollen-filled interiors are observable. Several salt and peppers (probably Lomatium piperi) were observed in bloom along the trail that winds along the east bank near milepost 2. January 11, 2012: Columbia Hills State Park. More than a dozen Dalles Mt. buttercups (Ranunculus triternatus) were observed (no flowers or flower buds yet) along with several salt and peppers (probably Lomatium piperi, again not in flower yet).